Market to digest OPEC/non-OPEC decision to raise supplies, tariffs take effect as the US-China trade war continues, opportunistic buying interest could emerge for LNG, and contract prices for thermal coal are expected to be settled. This week: tariffs take effect as the US-China trade war continues, opportunistic buying interest could emerge for LNG, and contract prices for thermal coal are expected to be settled. But first, oil market stakeholders gather in Singapore this week for the 34th Annual Asia Pacific Petroleum Conference. S&P Global Platts expects to welcome over 500 delegates from 55 countries. Over 50 experts will be discussing red hot issues in the global energy market. One topic would be the potential of blockchain technology and its use in commodity trade. So be sure to grab a copy of our special report called Blockchain for Commodities: Trading Opportunities in a Digital Age at the venue. You can also download a copy from our website. Participants are also expected to discuss production and trade flow outlooks, particularly after the Algiers meeting that happened this weekend, in which Saudi energy minister Khalid Al Falih said the kingdom would increase oil production. Other topics include the current geopolitical climate including sanctions, as well as the impact of US-China trade war on energy markets. Speaking of the trade war, China will start imposing a 10% tariff on US LNG imports from today. China accounted for 15% of US LNG exports last year. Tariffs will likely price US LNG out of the Chinese market, but there is no impact on prices expected in the near-term. Now, zooming in on the larger Asian spot market, prices pulled back last week, which could stimulate opportunistic buying interest from China and India. Soaring European gas hub prices could continue to provide a solid price floor. Soybeans is another key area affected by the US-China trade conflict. Chinese buyers are scouting for other possible supply sources for beans, including paying premiums for Argentinian cargoes. Beijing is also heard to be in negotiations with India for purchases of soybean meal to fulfil domestic demand. For our social media question this week: Do you expect the US-China trade conflict to escalate even further and affect more commodities? Share your thoughts on Twitter with the hashtag PlattsMM. 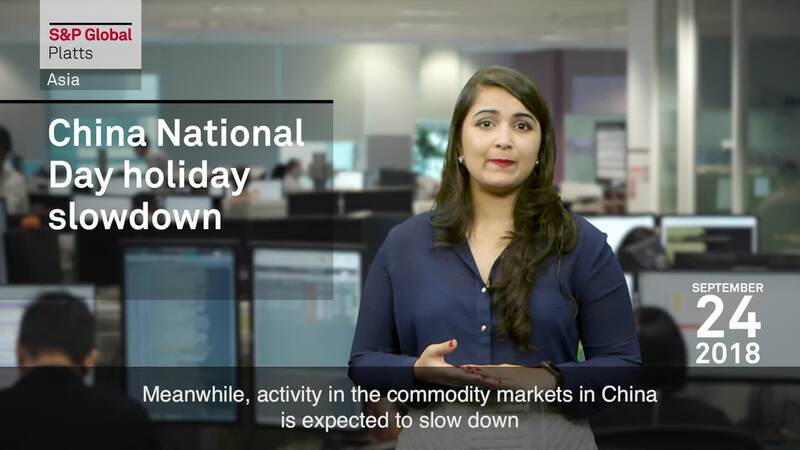 Meanwhile, activity in the commodity markets in China is expected to slow down ahead of national holidays in early October. Then, in thermal coal, producers in Australia are expected to conclude term contract prices with Japanese customers for the coming year, starting in October. The term contracts for Newcastle thermal coal are expected to exceed last year's levels as current spot prices are at multi-year highs. And that's it for this week. Thanks for kicking off your Monday with us and have a great week ahead.